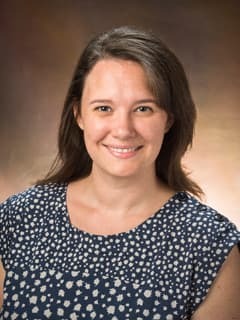 Laura Adang, MD, PhD is an attending physician in the Division of Neurology at Children's Hospital of Philadelphia, specializing in the care of children with multiple sclerosis and other neuro-inflammatory disorders. Helbig I, Adang L. Teaching NeuroImages: Atrophy in epileptic encephalopathy. Neurology. 2018 Jan 30;90(5):e442-e443. Pizzino A, Whitehead M, Sabet Rasekh P, Murphy J, Helman G, Bloom M, Evans SH, Murnick JG, Conry J, Taft RJ, Simons C, Vanderver A, Adang LA. Mutations in SZT2 result in early-onset epileptic encephalopathy and leukoencephalopathy. Am J Med Genet A. 2018 Jun;176(6):1443-1448. Ahrens-Nicklas R, Schlotawa L, Ballabio A, Brunetti-Pierri N, De Castro M, Dierks T, Eichler F, Ficicioglu C, Finglas A, Gaertner J, Kirmse B, Klepper J, Lee M, Olsen A, Parenti G, Vossough A, Vanderver A, Adang LA. Complex care of individuals with multiple sulfatase deficiency: Clinical cases and consensus statement. Mol Genet Metab. 2018 Mar;123(3):337-346. Epub 2018 Jan 31. Adang LA, Sherbini O, Ball L, Bloom M, Darbari A, Amartino H, DiVito D, Eichler F, Escolar M, Evans SH, Fatemi A, Fraser J, Hollowell L, Jaffe N, Joseph C, Karpinski M, Keller S, Maddock R, Mancilla E, McClary B, Mertz J, Morgart K, Langan T, Leventer R, Parikh S, Pizzino A, Prange E, Renaud DL, Rizzo W, Shapiro J, Suhr D, Suhr T, Tonduti D, Waggoner J, Waldman A, Wolf NI, Zerem A, Bonkowsky JL, Bernard G, van Haren K, Vanderver A; Global Leukodystrophy Initiative (GLIA) Consortium. Revised consensus statement on the preventive and symptomatic care of patients with leukodystrophies. Mol Genet Metab. 2017 Sep;122(1-2):18-32. Epub 2017 Aug 20. Adang L, Berger J. Progressive Multifocal Leukoencephalopathy. F1000Res. 2015 Dec 10;4. pii: F1000 Faculty Rev-1424. eCollection 2015. Adang LA, Lynch DR, Panzer JA. Pediatric anti-NMDA receptor encephalitis is seasonal. Ann Clin Transl Neurol. 2014 Nov;1(11):921-5. Epub 2014 Oct 30. Nichols LA, Adang LA, Kedes DH. Rapamycin blocks production of KSHV/HHV8: insights into the anti-tumor activity of an immunosuppressant drug. PLoS One. 2011 Jan 14;6(1):e14535. Parsons CH, Adang LA, Overdevest J, O'Connor CM, Taylor JR Jr, Camerini D, Kedes DH. KSHV targets multiple leukocyte lineages during long-term productive infection in NOD/SCID mice. J Clin Invest. 2006 Jul;116(7):1963-73. Epub 2006 Jun 22. Adang LA, Parsons CH, Kedes DH. Asynchronous progression through the lytic cascade and variations in intracellular viral loads revealed by high-throughput single-cell analysis of Kaposi's sarcoma-associated herpesvirus infection. J Virol. 2006 Oct;80(20):10073-82.